Our recommendations/plans are designed to result in cost savings by making sure the system in place makes sense for the way your room(s) are being used. Are they on timers or do they have to be kept on all the time? Do you have an attendant on site? Does the room provide for a nice experience for the user by working properly and eliminating musty smells (aroma)? Are users doing things to the equipment that may cause the equipment to fail? 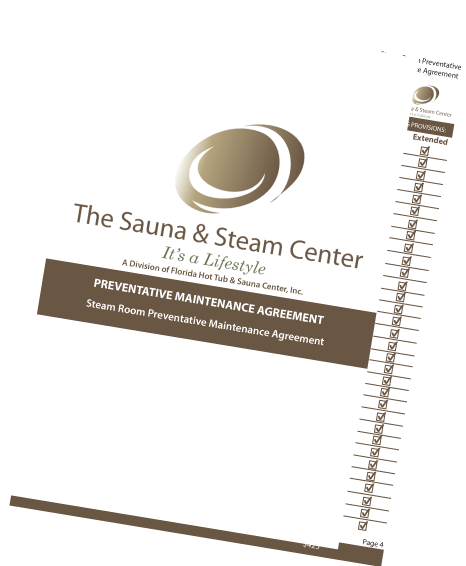 There are a lot of issues that can derive from neglecting to upkeep the various components of a Steam Room. All boilers are subject to have a descaling completed as often as every 3 months. You can get a lot of calcium build-up being deposited into the room or for people to breathe in. These are amongst some of the issues that you may experience when dealing with your steam room. Call us to find out how we can help you maintain your sauna. WHY YOU SHOULD CONSIDER A SERVICES PLAN? If you’ve had your system for some years and haven’t serviced it, good chance that you may run into some issues that could have been avoided or fixed at an economical expense to you. A Preventative Maintenance service will keep your equipment running the way it was attended to run when you first purchased it. Your customer gets to enjoy all the benefits that your Sauna or Steam room has to offer. The best way to avoid any problems with your Sauna or Steam room is to meet any potential problem ahead of time. With a Preventative Maintenance service, you will be able to minimize any issue and reduce customers complaints. CONTACT US TODAY TO GET DETAILS ON OUR PREVENTATIVE MAINTENANCE SERVICE.